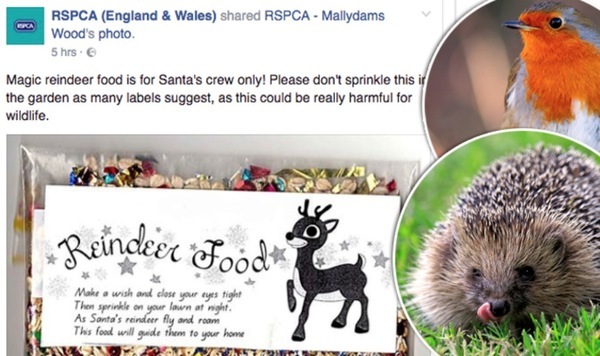 The RSPCA and RSPB have issued a warning to all children and their parents not to scatter ‘Reindeer Food’ in the garden this Christmas. ‘Reindeer Food’ is magical stuff on sale at many Christmas craft fairs and markets and easy to make. A mixture of porridge oats and glitter, it often comes with the following instruction: ‘Make a wish and close your eyes tight, then sprinkle on your lawn at night, as Santa’s reindeer fly and roam, this food will guide them to your home’. However, the RSPCA and RSPB have said that by scattering the mix in a garden, you will be putting garden birds and mammals at risk. Ingesting the plastic and glitter along with the oats could cause ‘long term damage’ to small animals’ digestive systems. They suggest that if you have made or bought some of the food, you should leave it in a bowl alongside Santa’s mince pie and drink inside the house.